Ausstellung im Maraya Art Center, Al Qasba, Sharjah, 1. März - 15. Mai 2015. Kuratorialer Essay und Foto-Rundgang mit Werken aller 15 Teilnehmer. With people, culture and information circulating globally at accelerating rates, our daily interactions are increasingly accented. While the processes of globalization promise homogenization, transparency and translation across cultures, the accent—localized in and expressed through the body—represents the residue or remainder that challenges these claims. It lies beyond translation, which strives to find equivalences for a particular expression in the syntax of another linguistic or cultural system. It is what exceeds language, resists assimilation and remains opaque. It is how newness enters a language or culture. As the aural component of language, it embellishes its script sonically. Yet it can also be visual. Accent marks, in particular, indicate how text is to be enunciated, that mediate the relationship between written and spoken language. In this exhibition the accent is not conceived of as only a linguistic phenomenon and the processes of cross-cultural interactions examined extend beyond the limits of language into the realms of images, spaces, sounds and smells. The accent is also understood as a feature that contrasts with or complements a decorative style, the key element that makes an interior come to life or a fashion outfit come together. It is additive, a pronouncement that focuses attention and a flourish that distracts. It is an embellishment that emphasizes difference, an accessory through which culture is expressed on bodies and introduced into spaces. The U.A.E.’s unique multicultural demographic creates a condition where social and cultural space and life are, arguably, always already accented. Read through this theoretically enriched notion of the accent the works in this exhibition examine different facets of this contemporary condition, revealing the varying textures of the distinct cosmopolitan ethos it produces. While accents are most closely tied to speech acts, accent marks are common in most written languages, expanding the phonetic capacity of the basic alphabet. A trained calligrapher, Pouran Jinchi’s practice investigates the relationship between the scripts and sounds of key regional languages like Arabic and Persian, visually teasing the two apart. In Tajvid #2 [Sourat Al Omran] (2007), Jinchi laboriously transcribes only the diacritical marks of Arabic from a verse of the Quran in ink onto a large paper scroll. Without the calligraphic curls of the consonants, the Quranic text is transformed into an array of abstract marks akin to Morse code. Language is emptied of meaning and reduced to its accents. Intended to ensure the Quran’s consistency through time, tajvid is a system of rules for recitation that guide the reader, especially those from different linguistic backgrounds, through the conventions of Arabic pronunciation. The use of this diacritical system distinguishes al-fusha, or classical, literary Arabic, from colloquial Arabic and Jinchi’s scroll inadvertently reminds us that it is precisely the absence of diacritical marks in everyday usage that allows for the rich diversity of local accents and dialects across the Arabic speaking world. We rarely think of technology as possesing an accent, though anyone who has used Google in different parts of the world will know this to be true; to penetrate a local or regional market technology has to adapt to its linguistic and cultural context. In Untitled (2015), Jaret Vadera investigates this phenomenon further through a commercially available Indian accented computer-simulated woman’s voice, an uncanny hybrid of technology’s global ambitions and the stubborn residues of the local. As this disembodied medium, which is simultaneously familiar and alien, reads out a text about accents compiled from Wikipedia entries, it challenges our assumptions about the link between accented voices and real bodies, and about which accents are privileged enough to forgo their bodies entirely. While much of the work in this exhibition champions the accent as a stubborn and subversive sign of difference, as a locus of agency and resistance, Lawrence Abu Hamdan’s Freedom of Speech Itself (2012) is an important counterpoint. Highlighting a controversial practice in which the accent becomes a tool of prejudice and injustice, Abu Hamadan’s audio essay examines the United Kingdom’s use of voice analysis to determine the origins and authenticity of asylum seekers’ accents, weaving their heartfelt testimonies together with statements by lawyers, phonetic experts and Home Office officials. Outsourced to private contractors based in other countries, and often conducted quickly over the phone, this supposedly scientific but essentially flawed practice has resulted in numerous wrongful deportations. The audio track plays in a darkened room that houses a large tabletop sculpture of voiceprints of two different people both saying the word "you." Made out of acoustically absorbent foam, the voiceprints are presented as topographic landscapes, mapping voice onto territory, and their undulating contours accent the room’s overall acoustics creating a unique listening environment. First presented alongside Islands (2010)—a gilded map of Dubai directly painted onto a wall in The Third Line Gallery that was eventually sectioned off and sold in the manner of a speculative real estate auction—each of Abbas Akhavan’s works on paper (all 2010) begins as a cheap and somewhat clumsy Xerox copy of a page from various anthropological and historical accounts of the Gulf. Each features a photograph of an activity integral to traditional pre-oil life and culture in the region—pearl fishing, date farming, nomadic pastoralism—whose details Akhavan carefully embellishes in precious gold leaf. While the photocopied image and the surrounding text fragments will inevitably fade over time the gilded details will remain lustrous. As such, these works function as wry analogs for the way in which cultural heritage is often constructed and preserved in the region, a process in which iconic elements of the pre-modern past are isolated, recuperated and marketed as essential parts of local culture, becoming key elements of national brands, while the broader context and history associated with it is gradually forgotten. Applied to and hence carried by the body, we associate perfume closely with its continuing presence. But a strong scent can linger long after the body that bore it has vanished. This uncanny experience, of encountering what amounts to an olfactory ghost, is familiar across the Gulf, where both men and women heavily perfume themselves, and where certain types of scent, especially of the musky Oud-based variety, are linked to discourses of heritage and cultural authenticity. Raja’a Khalid’s Oud Aura (2015) recreates this experience in the gallery with an industrial diffuser spraying a burst of aerosolized essential oil at regular intervals, accenting the space with an aura of Oud. Accompanying the diffuser are the first two pages of a recent patent for synthetic Oud. Laborious to harvest, natural Oud is very precious and prohibitively expensive and, given its high demand, has been largely replaced in the perfume industry by synthetic essential oil. By revealing the increasingly synthetic nature of this common marker of cultural authenticity Khalid’s installation questions the simplistic ways in which heritage is popularly constructed, understood and marketed. Ammar Al Attar’s photographs simply document the qibla wall in prayer rooms across the U.A.E. Establishing a typology, the series allows us to deduce the fundamental requirements of daily religious practice in Islam: a niche that designates the direction of mecca, space behind it where the devout can line up shoulder to shoulder in rows, clocks so that prayers are offered on time, a shelf where copies of the Quran are stored, and a microphone so the imam leading prayer can be heard by all. But variations—some subtle, some stark—reveal much about the larger structures where these prayer rooms are located and the types of people they serve. With strong clean lines, recessed lighting, and plush carpeting, those at malls like Mirdif City Center and Dubai Mall are slickly decorated to match the neoliberal, globalized aesthetic of the larger structures. Others are more distinct: at the Omar Al Khayam Restaurant in Al Dhaid, the qibla wall is covered with glazed ceramic tiles, a sagging maroon curtain struggles to block the blazing sun, and a cheap woven plastic mat provides little cushioning for the kneeling worshippers. As a series Al Attar’s photographs reveal how religious practice accents architectural space and vice versa. With a keen eye for the off-key, Farah Al Qasimi’s photographs represent the U.A.E. not through real life vistas but imagined projections, through found representations of landscapes that capture the fugitive traces of the local. Al Qasimi is drawn to interstitial spaces that hover between being rooted and untethered, where vernacular fantasies often betray aspirations to be global, privileging the eccentricity of the former over the homogeneity of the latter. In Meat Joy (2014), an Alpine idyll butts up incongruously against a dirty sink filled with waste from a busy day of butchering, the painted scene a modest attempt to escape the drudgery of the everyday. Old McDonald’s Sign (2014) meditates on the incomplete effects of globalization, capturing the ghostly outline of McDonald’s famous golden arches on a dusty wall by the side of a highway. Broken Sandcastles (2014) resists the urge to photograph Dubai’s famous skyline, presenting, instead, a tongue in cheek simulacrum: a detailed but somewhat distorted sand sculpture whose fragility questions the prestige of the original. Al Qasimi’s photographs suggest that locating oneself in the U.A.E. is tricky, as landscape here can be elusive and is always somehow accented. For Lantian Xie, the countless neighborhood cafeterias found across the U.A.E. are spaces that express the country’s true cosmopolitan spirit. Just as their menus are a mish-mash of many cuisines, their patrons speak different languages and hail from a variety of national, ethnic, cultural and socioeconomic backgrounds. In contrast to the exclusive celebrity-chef helmed restaurants in Dubai’s countless luxury hotels, which primarily cater to tourists and metropolitan elites and are somewhat interchangeable from city to city around the world, these modest establishments are egalitarian spaces that embody and express a vernacular cosmopolitanism rooted to the region. Woodland Fern No. 4 (2015) is a modest monument to this unheralded space of local multiculturalism, a 1:1 recreation of an accent wall found at Xie’s neighborhood Eat & Drink Cafeteria, its enigmatic title a reference to the wall’s exact shade of green. 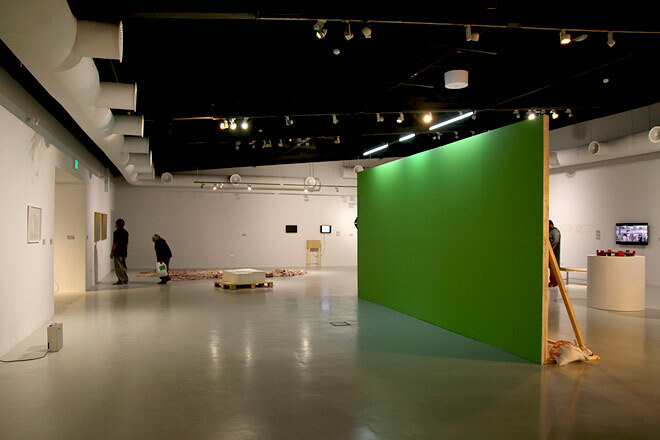 Extracted from its original architecture and imported into the gallery, the wall becomes a multivalent symbol: a monochrome mural, a Chinese spirit wall, and a chroma key green screen, a mutable background that, like the cafeteria that inspired it, can comfortably accommodate the whole world. Abdullah Al Saadi’s Alphabets (1990-2013) is a handmade book that showcases seven novel alphabets (six based on Arabic and one based on English) that the artist has developed over the last two decades. Al Saadi’s artistic practice draws significantly from the flora, fauna and landscape of the mountains near Khor Fakkan where he lives, and his alphabets often incorporate elements from his daily life in these rural surroundings. One set is based on the lines, curves and shapes suggested by the anatomy of his donkey companion, Camar Cande, while others take their cues from the bodies of birds and humans. Translating observations of his natural environment into an idiosyncratic linguistic system Al Saadi reminds us of the pictographic origins of many alphabets, and that languages are rarely abstract systems but are accented by the social, cultural and physical contexts out of which they emerge. Another of Al Saadi’s novel alphabets celebrates the humble sweet potato, a root vegetable indigenous to the rural area where he lives and works, and whose varying biomorphic forms have long inspired his artistic practice. Begun in 2000, Al Saadi’s Naked Sweet Potato (2000-2010) grew out of elaborate formal taxonomies the artist developed by simply cataloging the shapes of sweet potato encountered in daily life. Through the years, Al Saadi has repeated these suggestive forms, which are both bodily and scatological, in different media—small ink drawings, large colorful oil paintings, engraved rocks, delicate clay replicas, larger found metal sculptures and handmade bronze jewelry. In 2013, for "Emirati Expressions: Realised," Al Saadi translated these forms into twenty-four gold jewelry pieces, creating a set of precious but playful fashion accessories accented by nature’s breathtaking diversity and literally rooted in his native land. Also made of metal, Jinchi’s Hammered 7 and 8 (both 2014) each consist of a copper panel that represents a page from The Blind Owl, Sadegh Hedayat’s twentieth century literary masterpiece, a macabre text that revels in the inevitability of death, positing it as the true engine of life. Jinchi only transcribes the nuqtat to the metal sheet, each dot carefully hammered out by hand, creating a delicate but covert braille-like pattern of protrusions that catch the light and cast the slightest of shadows. Making language tactile, legible only to those in the know, these coded panels ensure the continued circulation of this controversial text. Interested in parallels between the Internet’s hive mind and the neuronal networks of our brains, Vadera uses the Web’s algorithms to accent language. For File_Not_Found (2013), Vadera created a set of contemporary hieroglyphics, feeding individual words into Google’s image search and picking a representative image from the results. The selected images are often far from what one might expect, expanding the potential meanings of each word. The looped digital video uses these image-word pairs to present a short text that meditates on the life and death of images and information in the digital age. The vinyl wall piece Even nowhere is someplace (2015) uses a similar strategy for the individual words in the titular phrase. The selected images are digitally abstracted and combined to create an ambiguous form that, like a Rorschach blot, allows for multiple interpretations. Finally, an invisible world map, indicating the geographic origin of each image file, is overlaid on top. While Vadera’s aphorism captures the tension between the virtual and real, mapping the formers physical coordinates in vinyl, it also asserts that absence or transience does not preclude belonging. Together these works posit the search engine as a key structure through which we understand, remember, and are remembered in our increasingly digital world. Vikram Divecha’s artistic practice draws attention to otherwise invisible or overlooked aspects of the U.A.E’s built environment. Working on a monumental scale, Divecha frequently engages local municipal authorities and collaborates with the migrant labor they employ to construct and maintain the urban environment. Divecha’s Sculpting resistance (2015), his first public project in Sharjah, subtly disrupts the formal order of Al Majaz Park by introducing an element of playful irregularity into its precisely manicured shrubbery. Once official permission was obtained from the Sharjah Municpality, Divecha began a two-month collaboration with the Pakistani gardeners responsible for maintaining the park’s hedges. In a series of drawing workshops, the gardeners were prompted to identify and sketch shapes and motifs culled from their visual vernacular that they thought were khubsoorat, or beautiful in Urdu. From this pool of sketches, new designs for the hedges were collectively selected and implemented and will be maintained by the gardeners through the exhibition’s run. Shifting agency from the Muncipality to the gardeners, Divecha’s project replaces routine order with vernacular flourish, enabling a modest moment of self-expression for a group of workers whose daily labor is otherwise largely invisible, though they toil in plain site. At Maraya, Divecha presents some of the project’s residues—sketches made by the gardeners, hedge trimmings piled up on garden mesh that mimic how they are collected in the park—accenting the gallery with material traces of his public intervention. The Message, Syrian American director Moustapha Al Akkad’s seminal 1977 film about the life of Prophet Muhammad, was made simultaneously in Arabic and in English so as to appeal to the broadest possible audience. While script, cinematography, sets and costumes were meticulously repeated in the two versions, different groups of actors—native speakers of each of the two languages—were used. Fayçal Baghriche’s The Message Project (2010) carefully weaves together footage of the two versions creating a hybrid filmic text that spans the linguistic divide. Juxtaposing the two reveals the subtle non-linguistic accents—gestures, cadences, tempo, body language—that each set of actors and the languages they perform in introduces into the filmic text demonstrating that the effects of language are not limited to the purely linguistic. A publishing practice based in Dubai, THE STATE’s Syntax Freezone (2015) is a specially commissioned anthology of essays that ruminate on the accents and gestures of language and difference. Though rooted to its home base, THE STATE does not limit itself through any regional remit and the volume’s far ranging contributions, both culturally and geographically, include such varied topics as: how post-Partition tensions in the Indian subcontinent eventually split the colloquial common ground of Hindustani into increasingly rarefied forms of Hindi and Urdu; the sounds of Malayalam and how they resonate in and through the Gulf; the draws and drawbacks of employing non-western syntax and writing in the vernacular; the degeneration of the prefix ‘Afro’ from a designation of political opposition to just another commodifiable fetish of racial identity; the varying vocabularies of hand gestures in Italy that index both xenophobic nativism and immigrant solidarity; and the brief history and social politics of Emirati sign language. The labor of maintenance is often invisible. Despite their integral role in daily life across the Gulf, migrant workers rarely appear in the region’s popular culture. Soap operas produced in the region, which are hugely popular, especially during the holy month of Ramadan, unfold in an affluent bourgeois world of extravagant houses, lavish interiors and fancy cars. But the maids, cooks, drivers and cleaners, largely from South and Southeast Asia, who labor daily in these spaces in real life, are missing. In SOAP (2014), Monira Al Qadiri reintroduces these absent subaltern bodies, superimposing them going about their chores onto original soap opera footage. However, her additions remain marginal—visually, spatially and diegetically—quietly haunting these interiors. Though silent, they visually enrich the original texts, their bodies adding subtle vernacular accents to the generic Arabic dialogue. Insignificant to the narrative, their presence shifts our attention from the melodrama to the extravagant mise-en-scène, mounting a critique of the vapid consumer lifestyles portrayed in these soap operas and which are increasingly taking hold across the Gulf. Khalid’s Blattpflanzen I and II (both 2015), German for leafy plants, appropriates two plates from the 1897 edition of the Meyers Großes Konversations-Lexikon, a German language encyclopedia published in Leipzig and Vienna. Carefully re-photographed and enlarged, and box framed so as to resemble a window, each plate is packed with detailed, life-like drawings of an assortment of exotic potted plants, providing a glimpse into a turn of the twentieth century conservatory or the household plant section at our local home improvement store. These prints are part of an ongoing investigation into what Khalid describes as the "politics of comfort," an excavation of the history of modern domestic interior decoration practices, which first developed in America in the early twentieth century and were subsequently exported to and adopted by the rest of the world. These practices grew out of centuries of European colonialism, which established a global trade network that brought exotic and precious commodities from far away colonies back to Europe and the New World. A key element in these protocols of interior decoration is the exotic household plant, which brings a bit of the lush green tropics into homes in cold temperate regions or, given our present context, into the hot arid desert. Akhavan’s Untitled (Garden) (2015) consists of cheap cloth sheets, covered with colorful floral patterns and sourced from a store in Sharjah’s cloth market, hanging like drying clothes from a wire strung up high across two poles in Al Majaz Park. The scale of the sheets verges on the monumental and, though made out of soft cloth, their rigid rectangular forms reference Richard Serra’s minimal metal sheet sculptures. Interrupting regular sightlines across the park’s expanse, Akhavan’s larger than life laundry subverts the normal, and arguably rational, order of the precisely laid out park, accenting this controlled space of public leisure with an unexpected symbol of domesticity, blurring the traditional division of public and private space. By disrupting the status quo, Akhavan’s intervention makes the park’s regular patrons more attentive to their surroundings and to how the built environment shapes behavior. And by juxtaposing two very different instances of garden design, the ‘garden’ printed on the hanging sheets versus the carefully laid out and manicured park, Akhavan’s intervention questions any clear distinctions between what is natural and what is manmade, arguing for the interpenetration of these two realms. Essentially an inverted crystal chandelier, Iman Issa’s utopian Proposal for a Crystal Building (2014) was originally intended for Cairo’s Tahrir Square, an entirely unexpected, sublime, luminous column meant to enliven an otherwise ordinary public space. Drafted almost a decade before its proposed location became ground zero for the Arab Spring, Issa’s visionary structure would have probably felt as incongruous in the urban environs of Tahrir then as now. But it would seamlessly fit into the futuristic skylines of many Gulf cities, which are filled with such ostentatious architectural icons. In the context of this exhibition, Issa’s glittering tower serves a symbol of the startling rate of urbanization in the Gulf over the last quarter of a century, and the broader regional impact of this transformation. No longer a future vision but a current reality, its once utopian incandescence feels somewhat extravagant now, allowing it to function as an oblique meditation on how such edifices profoundly transform and accent urban space and experience. Drawing their name from the acronym for the Gulf Cooperation Council, an inter-governmental body dedicated to fostering regional cooperation, GCC is a "delegation" of eight artists who strategically adopt the rhetoric, rituals and aesthetics of governmentality in the Gulf to reflect on its contemporary culture. GCC’s practice focuses on how power and authority in the region are expressed through elaborate protocols of bureaucracy and diplomacy, and mediated through architecture and interior design, through the careful engineering of space and experience. Figure B: Micro Council (2013) is a highly detailed miniature model of a hexagonal conference table used at two recent summits of the Council. Shrinking the massive original down to a less intimidating size allows this fascinating artifact of power to be analyzed and studied. Synthesizing discrete elements borrowed from various Middle Eastern and European decorative traditions into a distinct style that encapsulates power in the region, this hybrid object amalgam reveals the accent of power and politics in the Gulf. Especially during twilight, surprised motorists circling Dubai’s Zabeel Palace have often reported seeing peacocks by the side of road. An earthbound bird, the peacock is a regal symbol across many cultures, and these wandering strays are part of a large muster that live on the palace grounds. Wedged up high in the gallery’s rafters, exhausted by the effort it took to get there, Xie’s Taxidermy Peacock (2014) is a melancholic allegory for his complex relationship to the U.A.E., a home he cannot belong to but is also unable to fly away from. If Xie’s Taxidermy Peacock laments an unrequited desire to belong, his installation Captain Majid (2015) asserts how the eccentricity of the vernacular can foster a powerful sense of belonging. Captain Majid—the dubbed Arabic version of Captain Tsubasa, a Japanese manga and anime about the adventures of a young footballer—brings back vivid childhood memories for those who came of age in the Gulf in the late 1980s and early 1990s. It is emblematic of the idiosyncratic multicultural landscape of television and popular culture they grew up with, one that preceded globalization’s homogenizing influence. And for a Chinese boy growing up in the Gulf, Majid’s racial and cultural syncretism, an Arabic voice coming out of an identifiably Asian body, must have felt familiar and comforting. In Captain Majid, Xie presents traces of Tsubasa’s complex transcultural history: an animation cell from the original series, a pure image, before voice; an audio track recorded by Amal Hawijeh—Captain Majid’s Arabic voice—trying to sing the series’ original Japanese theme song; and a takeaway postcard bearing a refusal to collaborate from Yoko Ogai, who was Captain Tsubasa’s original Japanese voice. Xie’s open-ended installation investigates the ways in which an act of transcultural and transgendered ventriloquism may have helped root an entire of generation of kids—both expatriate and Emirati—to a specific time and place they call home. Mahmoud Kassem, The UAE credit card with a scent: Al Hilal Bank targets women with aromatic offer, The National, January 18, 2015, accessed January 20, 2015. Launched in 1992, Rupert Murdoch’s Star TV satellite network transformed the media landscape across Asia, beaming programming into people’s homes twenty-four hours a day, seven days a week. Before the advent of Star TV, television options in the U.A.E. were limited, with only a handful of locally run television channels showing a hodge-podge of programs sourced from elsewhere, primarily the U.S.A. and the U.K.
Rym Ghazal, People rarely call me by my real name they call me Captain Majid or Mowgli, The National, October 27, 2014, accessed October 29, 2014. Gayatri Chakravorty Spivak, "Can the Subaltern Speak?" in Marxism and the Interpretation of Culture, Cary Nelson and Lawrence Grossberg (Urbana and Chicago: University of Illinois Press, 1988), 271-313. Autor, Kunsthistoriker, Kurator. Lebt in Sharjah, VAE, und Brooklyn, USA. Kuratorialer Essay, veröffentlicht im Katalog der Ausstellung "Accented". Nafas dankt dem Maraya Art Center in Sharjah und Murtaza Vali für die Erlaubnis zur Übernahme des Textes.